Within the three years, the course provides an intensive and systematic programme of training, equipping each student to meet the challenges facing clinical psychology and to make a unique contribution to the Irish Health Services. 10th December 2018 *places may be filled before this date. The doctorate in Clinical Psychology is designed to provide high quality post-graduate professional training in Clinical Psychology leading to the award of a doctoral qualification. The course is designed to produce clinical psychologists who are equipped with the skills to respond flexibly to the changing demands of the Irish health and related services. A core value in the course is the emphasis on linking theory and practice, informed by the reflective scientist practitioner philosophy of integrated training in research methods, academic knowledge and clinical experience. The course comprises three major components: (i) research training, (ii) academic training and (iii) clinical placements. Students currently spend approximately 55% of course time on clinical placement. The remainder is divided between the taught academic programme and research activity. There will also be block teaching modules throughout the three years of training. Candidates are assessed throughout the course by (i) examinations, (ii) coursework (including reports of clinical activity), (iii) written submissions based on oral presentations (iv) a dissertation and (v) evaluations of clinical competence. All candidates are required to attend a viva-voce examination. Assessment is based on the evaluation of performance on fifteen taught academic modules, six clinical placements, four reports of clinical activity, a small-scale research project and a dissertation. All of these assessed elements of the course must be passed to successfully complete the programme. The aim of clinical placements is to ensure that trainees develop core skills through experiences with different client groups. In addition, trainees will apply a variety of psychological models to a wide range of clinical problems and clients across the age spectrum, and in a variety of settings. Core placements involve direct assessment and intervention work with clients and triadic work with carers and others. The Course allocates 55% of total available Course time to clinical experience. Each of the six placements extends across a period of five months, in order to allow the trainees adequate time to develop their skills in assessment, formulation, intervention, evaluation and reporting. A developmental model of placement sequencing has been developed by the Course, which is regularly reviewed. This provides students with the opportunity to develop their clinical experience in a planned manner. Currently, the first year trainees commence their training with a five week block induction programme which addresses the practical issues pertaining to adult work. Following their induction programme, trainees commence a five month placement in either a child or an adult mental health service and then move in sequence to either child or adult then a learning disability placement. Elective placements mark an important progression in the student's development in terms of developing and consolidating areas of special interest. In addition, they serve to focus the student's preparation for work beyond the Course. The Course has developed placements in a wide range of specialist services across the Dublin region. Specialist experience consolidates and develops the student's existing expertise and allows for special interests. On this Course, a placement could be specialist with respect of client group; setting; or therapeutic orientation. 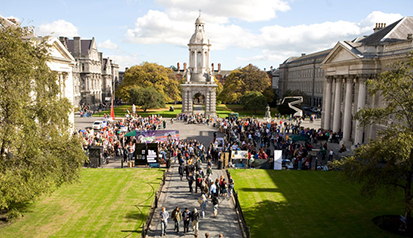 The course is run by a core team of eight academic and two administrative staff, six of whom are employed by Trinity College and two by the Health Service Executive. All academic staff have an ongoing commitment to clinical work within the HSE, Eastern Region. The course Steering Committee has representatives from all the major stakeholders. Course team members attend HSE psychology meetings and HSE and voluntary sector clinical psychologists are heavily involved in course development and delivery. Placements are drawn from the HSE region and from the voluntary sector. These arrangements help to foster an excellent spirit of collaboration between the course and its sponsors. Please see the student handbook for more information on the course. Student handbooks are subject to review each year in line with college policy. Applicants will be formally required to hold at least an upper second class honours primary degree in Psychology from a recognised University Course, which confers eligibility for graduate registration with the Psychological Society of Ireland. A candidate's demonstrated interest in the field of clinical psychology and research competence will also be taken into account. Please note: As trainees are employees of the Health Service Executive (HSE) or other approved Health Care Provider, we require that applicants have the right to work in Ireland without restriction. Non-EEA applicants are therefore not considered unless they have a pre-existing right to work in Ireland for the duration of the course and the required three years after completion. Please contact the course office (see contact details above) for further information about the application process. Please note that all documents must be supplied and conditions of offer met by July 31st or any offer made will expire. A list of current course fees is available in the Course Fees section of the Academic Registry website. IMPORTANT: Fees may increase annually. Please consult information about eligibility for admission as an EU/Non-EU student and note that EU applicants must satisfy specific requirements to be deemed eligible for EU fee status.